Where does the FOMC get these ideas? We all know that Janet & Friends are trigger-happy, dying for a plausible excuse to begin the so-called “rate lift-off”. We also know that the labor market is the “star of the play”, being groomed to be the signal that will open “heaven´s gate”! The “grooming” has changed “styles”. Initially it was 6 to 6.5 “inches” and over the past couple of years has been “trimmed” down to 5 to 5.2 “inches”. There is a third principle that I subscribe to, which, though not as fundamental as the first two, also plays a role in my forecast and in my judgment about the appropriate posture of monetary policy today. 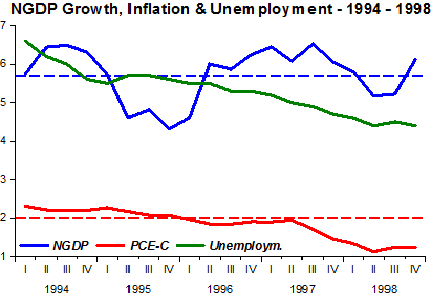 Utilization rates in the labor market play a special role in the inflation process. That is, inflation is often initially transmitted from labor market excess demand to wage change and then to price change. This third principle may be especially important today because, in my view, there is an important disparity between the balance between supply and demand in the labor and product markets, with at least a hint of excess demand in labor markets, but very little to suggest such imbalance in product markets. 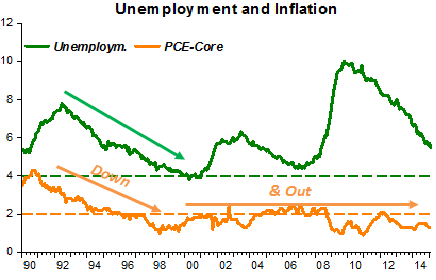 Despite the sharpness and force of the Phillips Curve/NAIRU model, it can be difficult to implement in practice. Still, this relationship was about the most stable tool(!) in the macroeconomists’ tool kit for most of the past 20 years; those who were willing to depend on it were likely to be very successful forecasters of inflation, and the record speaks for itself on this score. Nevertheless, the combination of the 7-year low in the unemployment rate and 30-year low in inflation was a surprise to those using this framework. The challenge is to understand why we have been so fortunate. But, it should also be noted that monetary policy has responded appropriately to this surprise. That is, monetary policy has been careful not to be tied rigidly to a constant estimate of NAIRU. Instead, in my view, monetary policymakers have, in effect, implicitly adjusted their estimate of NAIRU to reflect the incoming data; this might be viewed as following a procedure like the time-varying parameter estimation technique applied by Robert Gordon and others. 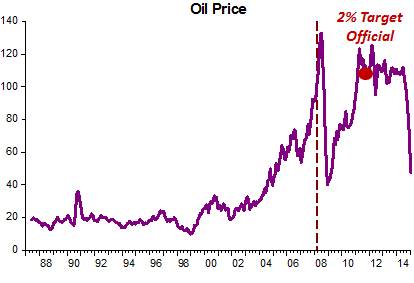 We were all very lucky that Greenspan didn´t “buy” their suggestion at the time. Unfortunately, now Janet is the Head-dresser, and has enticed others who appear to be like-minded, or that have come on board simply because that´s the best bet available to “open heaven´s gate”. You can easily understand why the first “style” was 6 to 6.5 “inches”. That´s the unemployment point below which wages began to rise. However, that was during the years before the Fed messed-up, when it strived to keep nominal spending on an “even keel”. 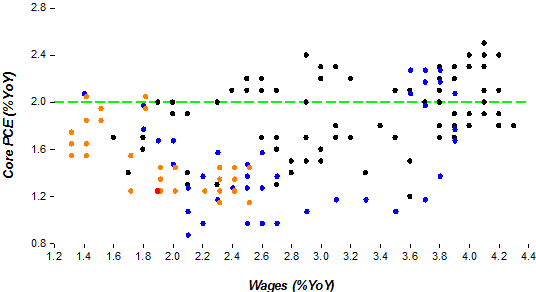 When it did mess up, although unemployment rose, wage growth didn´t budge for quite some time (the flat part of the blue line). That´s evidence for wage stickiness! 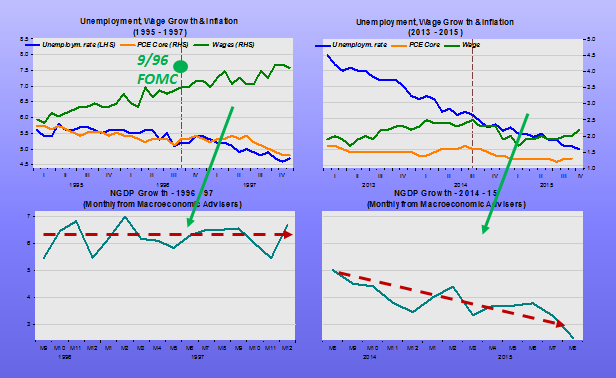 When wage growth finally dropped, it´s growth remained about the same even though unemployment was falling. 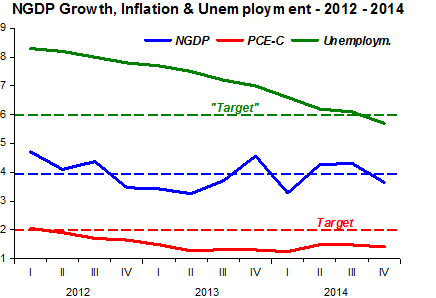 As required by the “playbook”, Janet is adjusting (“trimming”) her estimate of NAIRU to reflect incoming data. Now we are at the April 2015 point (red). Janet´s view is that if unemployment crosses the “Rubicon”, wages will “take-off”. How fast they have no idea. I do. Given the level and the rate at which nominal spending has been growing (4% and likely falling), wage growth will likely increase very little. Why all the anxiety about the impact of wage growth on inflation? It´s a fixed and longstanding image in Janet´s head. Ordinary mortals’ can´t see it! What will happen? 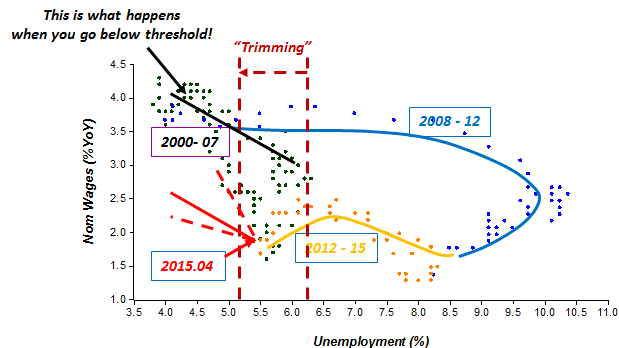 More likely they´ll keep “trimming” the NAIRU estimate “to reflect incoming data”. 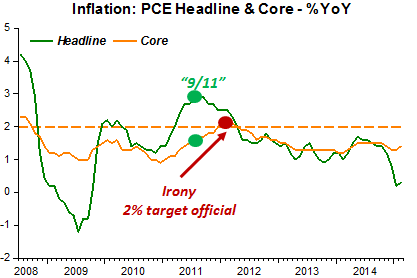 What would we be hearing from the Fed if, instead of 0.3% headline 1.4% core, we had 2.9% headline 1.7% core? Any doubt they would raise rates immediately (through a Conference Call)? However, that was the combination that existed in September 2011 (“9/11”), when QE3 was still to come! 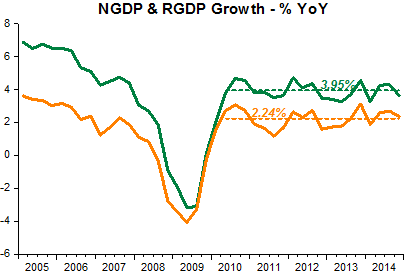 The “heartbeat” of nominal and real growth has not changed during this time, remaining close to 4% and 2.2%, respectively year on year. 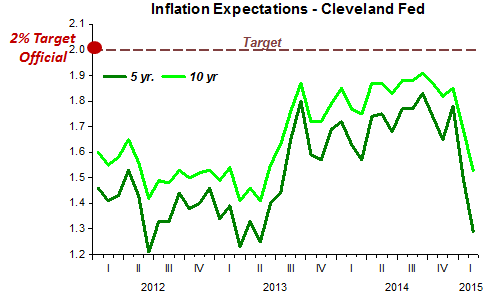 Overall, both measures of inflation have been well below target for most of the time since 2008. What has changed is unemployment, which has dropped from 9% in September 2011 to 5.5% in February 2015 and is getting “dangerously close” to her latest “estimate” of NAIRU (5% – 5.2%)! She should remember James Tobin, her thesis adviser at Yale who, on the year she was awarded her PhD, 1971, wrote “Living with Inflation”. Only now she wants to change that a bit and push for “Living without inflation”! So I find Tony Yates´ “insistence” on raising the inflation target “romantically naïve”! An elusive target is no target at all! For some time the big monetary policy discussion revolved around a single word: “Patience”. And the word had a clear “sell date” once it was removed: Two FOMC Meetings. That was certainly a problem for the Fed who hates being “tied-up and gagged”. Everyone, without exception, expected the “word” to be removed at today´s FOMC Meeting, eagerly anticipating what would replace it. To support continued progress toward maximum employment and price stability, the Committee today reaffirmed its view that the current 0 to 1/4 percent target range for the federal funds rate remains appropriate. In determining how long to maintain this target range, the Committee will assess progress–both realized and expected–toward its objectives of maximum employment and 2 percent inflation. This assessment will take into account a wide range of information, including measures of labor market conditions, indicators of inflation pressures and inflation expectations, and readings on financial and international developments. Consistent with its previous statement, the Committee judges that an increase in the target range for the federal funds rate remains unlikely at the April FOMC meeting. The Committee anticipates that it will be appropriate to raise the target range for the federal funds rate when it has seen further improvement in the labor market and is reasonably confident that inflation will move back to its 2 percent objective over the medium term. This change in the forward guidance does not indicate that the Committee has decided on the timing of the initial increase in the target range. The “sell date” has gone; the Fed has” untied and ungagged” itself! It also has lowered once more the unemployment threshold that would more clearly indicate an interest rate move was imminent. For those with a short memory, that threshold has been 7%, lowered to 6.5%, lowered again to 6%, and under Yellen, a NAIRU faithful, it has been put in the 5.2% to 5.5% range, which has now been lowered to the 5% – 5.2% range! Fed officials have marked down considerably their view of the “Nonaccelerating inflation rate of unemployment,” or Nairu. The new central tendency of the long run unemployment rate is 5 to 5.2%, down from 5.2% to 5.5%. Ms. Yellen told WSJ’s Jon Hilsenrath this may explain why so many FOMC members have marked down their path of interest rate increases: it implies more slack in the economy, less inflation pressure and a need for easy policy for longer. The Fed’s forecasts today contained a shallower path for interest rates going forward. Instead of increasing rates at 0.25% at every meeting, the median interest rate estimate from the Fed calls for only 7 increases over the course of the next 14 meetings. 1) Inflation has come in further below the Fed’s target than they expected, and that calls for lower rates to bring it back. 2) The Fed has lowered its estimates of the normal rate for the unemployment rate. 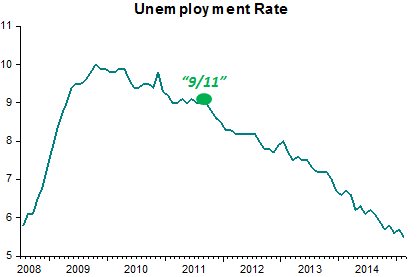 That means, the unemployment goal is a little bit further away than previously estimated. That too calls for somewhat lower interest rates, she said. Later this year, with inflation remaining far below target, and unemployment continuing to fall as it has for the past 5 years, the “new range” for Yellen´s “beloved NAIRU” will be put at the 4.5% – 5% range. At this rate, in a few years’ time, Yellen will start believing 4% unemployment is the “real thing”! Maybe that´s possible, not because it is Yellen´s target, but because the Fed will have (re)learned how to conduct an “appropriate monetary policy”, that is, a monetary policy that maintains nominal stability at the appropriate level of activity. Mr. Williams was quite upbeat about the U.S. economic outlook in an interview with Fox News Channel, echoing remarks made to The Wall Street Journal Thursday. Citing broad-based employment gains in both low- and high-wage sectors, Mr. Williams said he believes the U.S. unemployment rate, currently at 5.7%, will fall to 5% by the end of this year. That’s a level consistent with full employment, which Fed officials see as the lowest rate of joblessness that doesn’t generate undue inflation. Asked about U.S. inflation, which has been undershooting the Fed’s 2% target for nearly three years, Mr. Williams was also sanguine. He said the recent hit to consumer prices had been primarily driven by plunging energy costs, adding he expects inflation to stabilize and return to the central bank’s 2% goal over the next couple of years. 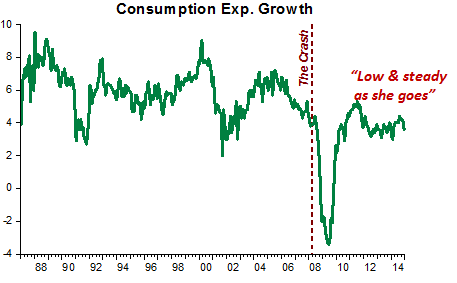 Where does he see the “good consumer spending trajectory”? Inflation has been falling ever since the 2% target became official, irrespective of oil prices remaining high or, more recently, falling! Medium and long-term inflations expectations have remained below target throughout and are now plunging! Maybe Williams is looking at things upside-down! At this point the analysis confronts a widely held concern, encouraged by at least some monetarists, that such a rapid rate of growth and sudden acceleration of the money supply , would unfavorably influence prices and inevitably set off a new round of inflation. Our analysis indicates that such concerns are unfounded; it implies that inflation systematically accelerates only when unemployment falls below NIRU, and the M1 growth that we expect will be needed as a component of a policy package aimed at approaching NIRU from above over the next two years. In economics, it´s interesting to observe how some things, especially those that require “estimation”, become “gospel” and, despite their suspicious origins, never go away, being endlessly “reestimated”. 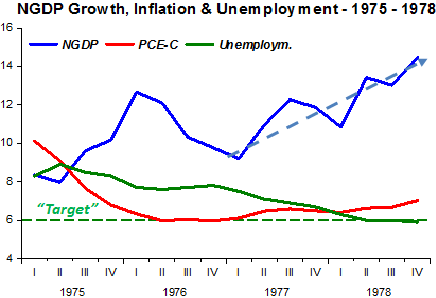 The triangle model shows that the puzzle of missing deflation is in fact no puzzle. It can estimate coefficients up to 1996 and then in a 16-year-long dynamic simulation, with no information on the actual values of lagged inflation, predict the 2013:Q1 value of inflation to within 0.50 of a percentage point. 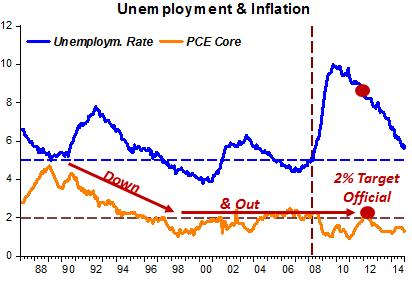 The slope of the PC relationship between inflation and unemployment does not decline by half or more, as in the recent literature, but instead is stable. The model’s simulation success is furthered here by recognizing the greater impact on inflation of short-run unemployment (spells of 26 weeks or less) than of long-run unemployment. The implied NAIRU for the total unemployment rate has risen since 2007 from 4.8 to 6.5 percent, raising new challenges for the Fed’s ability to carry out its dual mandate. Maybe John Williams is a fervent adept!